I’m loving having this long weekend stretching out before me. Yesterday, I read almost a whole book (this is good but rare for me) — the third I finished in 4 days. This was after the fog had dissipated quite a bit. But no. Just as I won’t be dictatorial in my pursuit of reading this weekend, I also won’t be turning the weekend into a nonstop Bloggiesta. Plans for the weekend became a little more up in the air when my husband called me yesterday afternoon from the thrift store, asking how many cubes I thought I needed for yarn storage. He had been planning to build me modular shelving units for my yarn, wool, patterns, knitting needles. But these were already boxes, for way cheaper than he could buy the wood for. The store had them in bulk, and they weren’t broken or dirty. So figuring out the organizational system for the fiber wall will cinch up some of this weekend, I’m sure. But first, after I finish my leisurely coffee, I’m off to get a massage. What plans do you have for this weekend? Are they written in stone or sand, or some material in between? This isn’t a long weekend for us, but we have fun plans anyway. Today’s college football and tomorrow, we’re having some neighbors in. I hope you get lots done over the weekend. Yes! I will be having a non-stop bloggiesta as you called it. Though I hope to catch a movie or two and eat some good food and maybe even read. Massage. Yes. Mental note. I would like to plan such a thing. 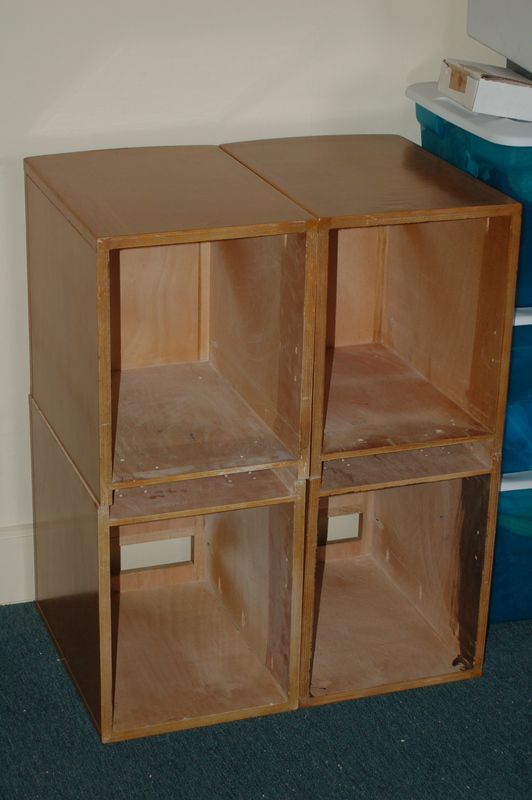 I clicked over to the TwitPic of the finished storage system … now you need to fill it up! I hope you enjoyed the long weekend. That pic from your window looks surreal; almost like a stage set, or the props from Mr. Rogers Neighborhood. I’m curious: What in the photo makes you think surrealism or Mr. Rogers Neighborhood?